I may have mentioned in a previous post that my husband and I purchase beef by the cow. Actually, 1/2 a cow. This is the only possible way we could afford grass fed, pastured beef. It’s a lot of money up front, but it lasts a year and gives us fantastic beef from a great farmer. Per pound, it’s cheaper than the factory farm stuff. The downside? Lots and lots of roasts. Part of the reason I started this blog was to go out into the world and try to find new and exciting things to cook, especially with the roasts. I may have also mentioned that my kids cry when I say we are having pot roast. Yeah, fun. Good times. So, one day we were exploring the local restaurant scene and came across a restaurant called Sin Frontieras. 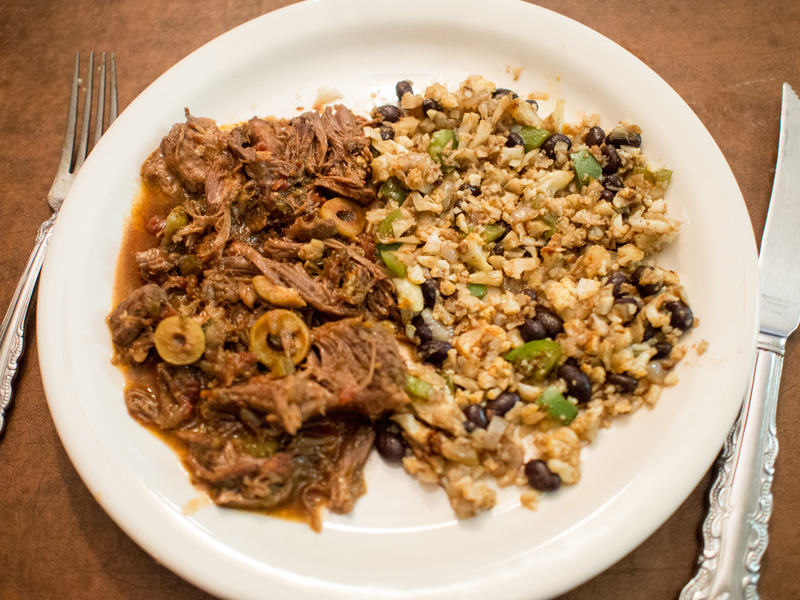 On the menu was a dish called “Ropa Vieja”. My high school Spanish kicked in and I said “old clothes”? What kind of dish is named “old clothes”? 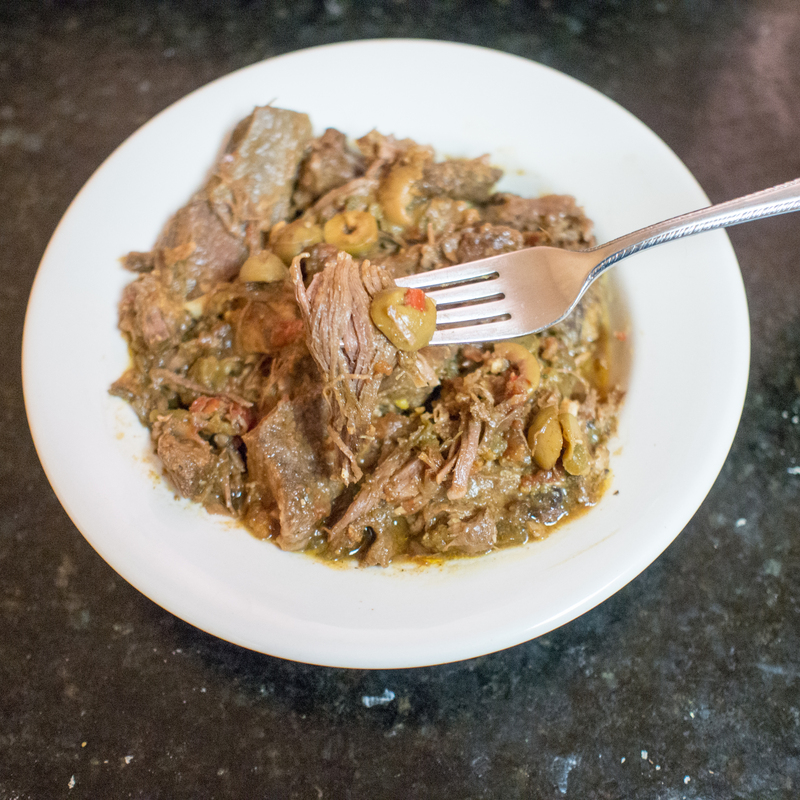 Turns out it’s a Cuban version of pot roast. It’s called “old clothes” because the cooking process makes the meat look like stringy cloth rags, or old clothes. Regardless of the name, the dish is superb. This dish would be PERFECT to recreate at home. I need something other than a regular “yankee” pot roast recipe and my wine and onion braised roast. And, as a bonus, I can repurpose the leftovers and call them something like fajitas the next night! In the interest of authenticity, I should note that I did not use flank steak or brisket. I don’t really have a surplus of those. But I do have a crazy amount of chuck and arm roasts. So, I used 2 of my chuck roasts, about 4 pounds. I am a working mom. I get home around the time most people are starting dinner. I am slightly behind because I have to get the kiddos started with homework and such. So, dinner management drives my life. I promise my recipes to be ones that a real life working mom (me) uses. Tonight I made Ropa Vieja because my mom asked me over at the last minute for dinner. While she’s cooking dinner tonight, I am cooking also. I’ll just have it tomorrow and use the leftovers (even my family can’t put away 4 pounds of pot roast) some other time in the week. I’ll also cook something like this in the background (since it just sits in the oven) one night when I make a grilled meal or skillet meal. Then, I put it in the fridge and just warm it up the following day. Given the long cooking time, it’s not really practical to cook on a weeknight and expect to eat before 7:30. Start to finish, this is probably a 3 hour meal. I know people will put this in a slow cooker. I have done that with similar dishes. I am just not wild about the slow cooker. Things just taste better to me in the dutch oven. As an aside, I would like to rant about some of the few cooking shows left on the Food Network on the Cooking Channel. There are more than a few shows that give the illusion of helping working moms cook. One claims to make meals in a half an hour. Those meals can be crazy expensive with one off ingredients you’ll never use again. I saw one that was Thai inspired beef noodles that included flank steak, curry paste, fish sauce, shallots and shiitake mushrooms. Does the meal sound lovely? Yes, it does. But, by the time I bought all the ingredients, I could have gone out to a restaurant. There’s another show that claims you can make things almost homemade by incorporating pre-made ingredients in the recipe. When the host suggested that I buy pre-cut onions, I was out. Really? You can’t cut your own onions? And again, pre-cut onions are expensive. On the other end of the spectrum are the money saving shows that essentially pad out their menus with rice, pasta or bread. These are items I try to avoid because of their high calorie and carb contents and little to no nutritional value. Also, I found the valuations absurd. There was one episode of a show that claims to make all meals for $10 that called for skirt steak, baking potatoes AND kale. A pound of skirt steak runs me $8.99 minimum. To buy everything in the episode is well over $10 in my area. Lastly, there is actually a show that advises you to cook your entire week’s meals in one day. In other words, use one of the two days a week (if you are lucky) you have completely with your family to cook meals for the rest of the week. Oh, I’d love to go to the movies or for a hike with you, son, but I need to cook tonight’s meal and next week’s. Seriously? Does anyone do it? I would run out of pans and refrigerator space before I finished the week! The family review of this recipe was overwhelmingly positive. My son said I was allowed to make this dish whenever I wanted. It was “awesome”. So, I have found one pot roast recipe he likes! Eureka!! 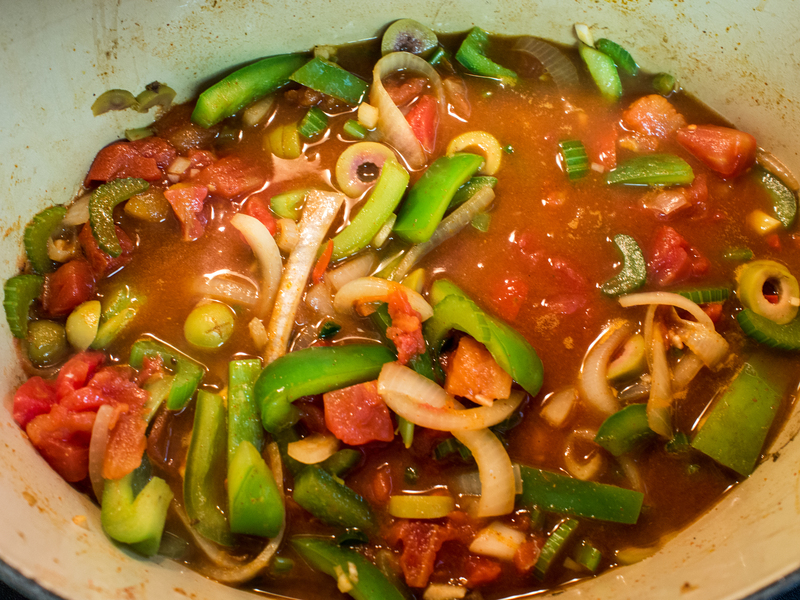 1/4 cup of lard, vegetable oil, bacon drippings, etc. Heat oil in a dutch oven (I used a 5 quart). Salt and pepper the beef and brown on each side. Remove and set aside. 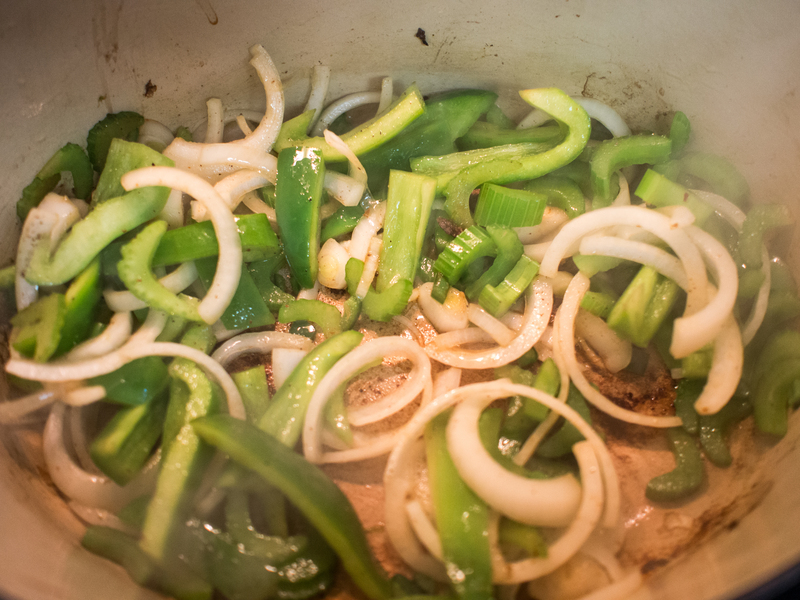 In the dutch oven, place the onion and peppers and sauté for about 2-3 minutes. Add the garlic, bay leaf, cumin and paprika. Cook until fragrant, about a minute. 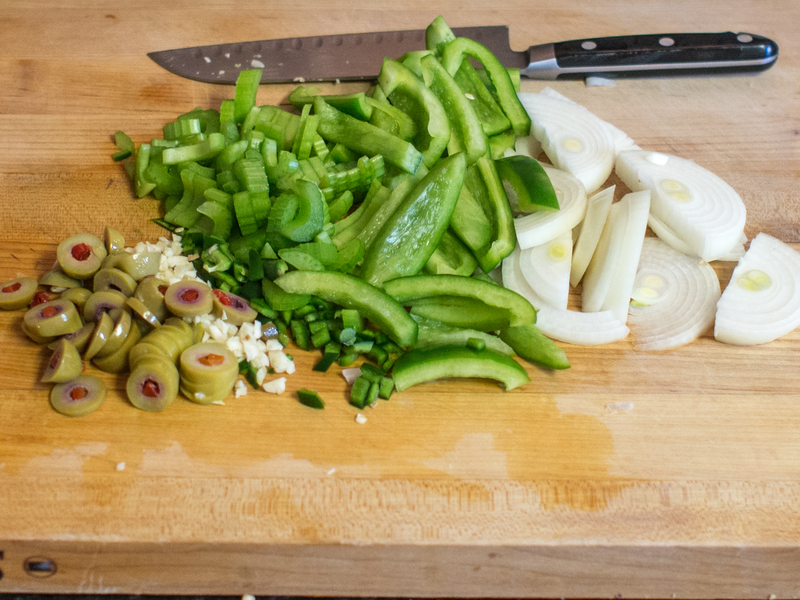 Add the olives, sauté for another minute. Deglaze with the beef broth and scrap the brown bits off the bottom of the pan. Add the tomatoes. Bring to a simmer. 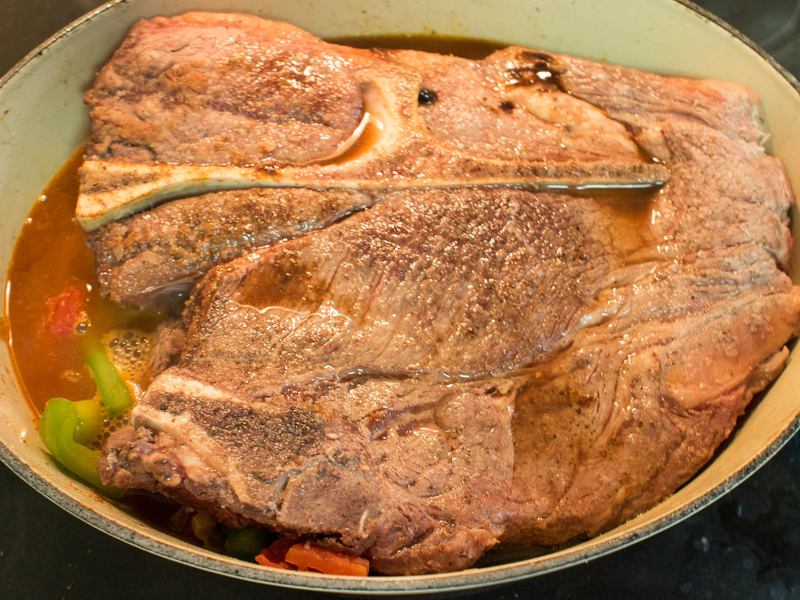 Return the beef and any accumulated juices to the dutch oven. 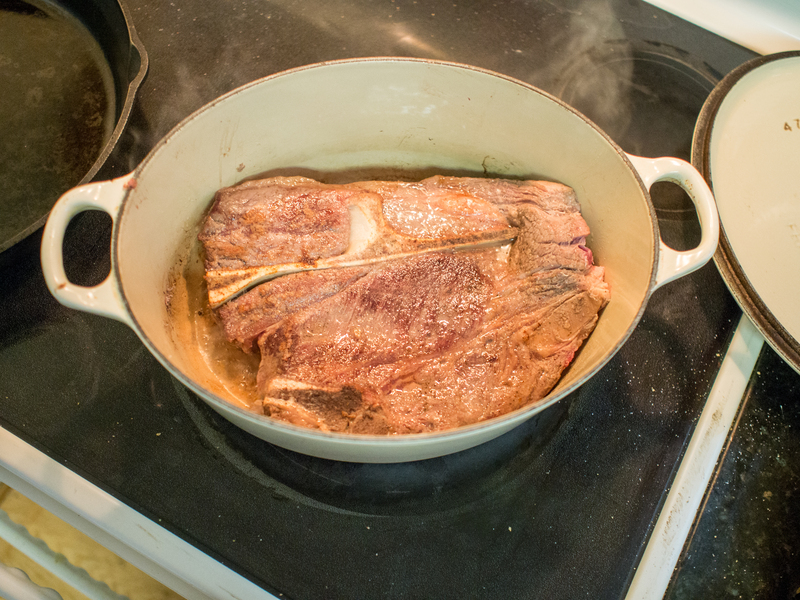 The liquid should come up the sides of the beef without completely covering it. If your liquid is short, add more broth or water. Place the lid on the dutch oven and place the pot in the preheated oven. Bake for 2 hours or until the meat pulls apart, resembling “old clothes”. 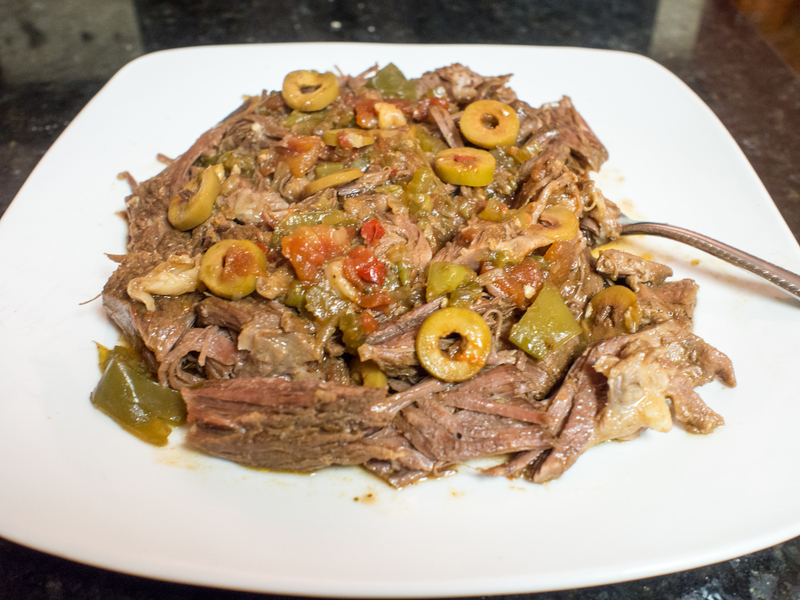 This entry was posted in Beef, Main Dishes and tagged chuck roast, Chuck steak, Cuban, Dutch oven, flank steak, Food Network, Olives, Pot roast, Ropa Vieja, Slow cooker on May 13, 2013 by dawn of food.